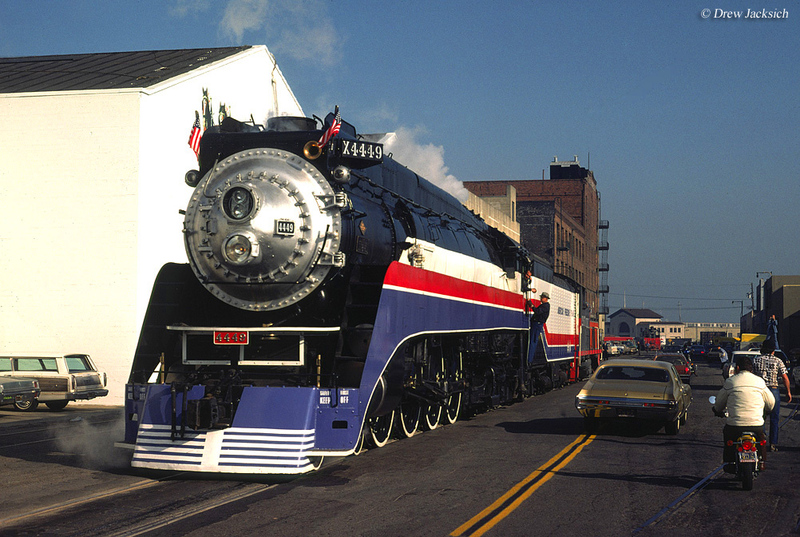 Few special steam excursions over the years have garnered so much attention and remain regular topics of discussion as the American Freedom Train of the 1970s. This consist was first conceived by Ross Rowland early during that decade and took a monumental effort just to see it become reality due to time constraints and funding issues. The train, of course, was meant to celebrate America's Bicentennial and it was very successful in accomplishing that endeavor. However, the lasting impression of the train was its endowment to the railroad preservation community. Not only did Rowland's idea allow for the restoration of three large steam locomotives, one of which is still in service today, but it also inspired the concept of excursions, particularly steam powered, as a popular means of drawing the public back to the rails (and preserving history at the same time). The American Freedom Train that most know of today was actually not the first. Directly after the end of World War II there was the original Freedom Train, which hit the railroads in 1947. 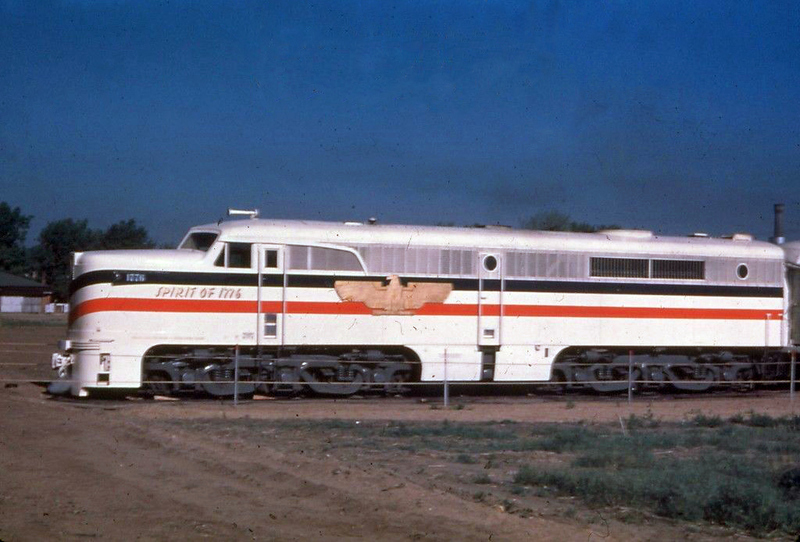 It was also painted in patriotic red, white, and blue and led by a pair of matching Alco PA-1s. 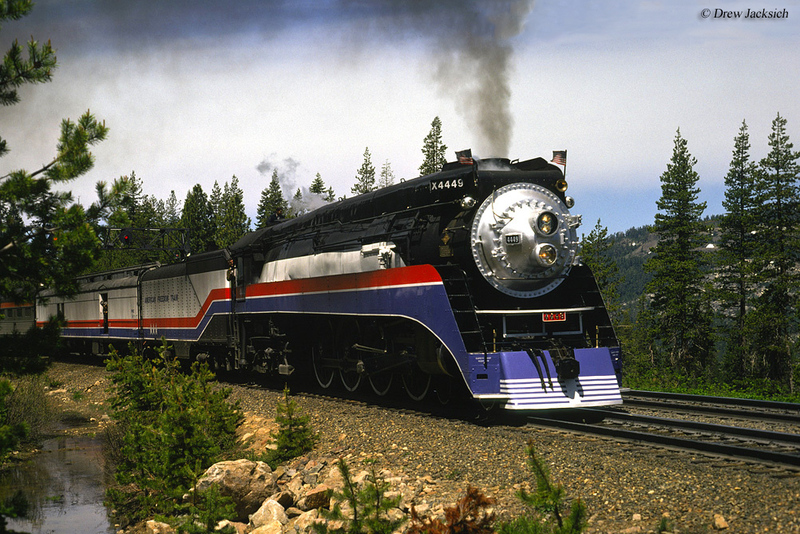 The purpose of the train, first proposed by Attorney General Tom Clark, was designed to remind Americans to not take their freedom for granted by presenting a copy of the U.S. Constitution, Declaration of Independence, Truman Doctrine, Bill of Rights, and other precious Americana (protected by select U.S. Marines during every trip) on a nationwide tour that spanned more than 300 cities across all of the lower 48 states between 1947 and 1949. The train was quite popular and witnessed thousands of visitors passing through its cars during the two year tour. 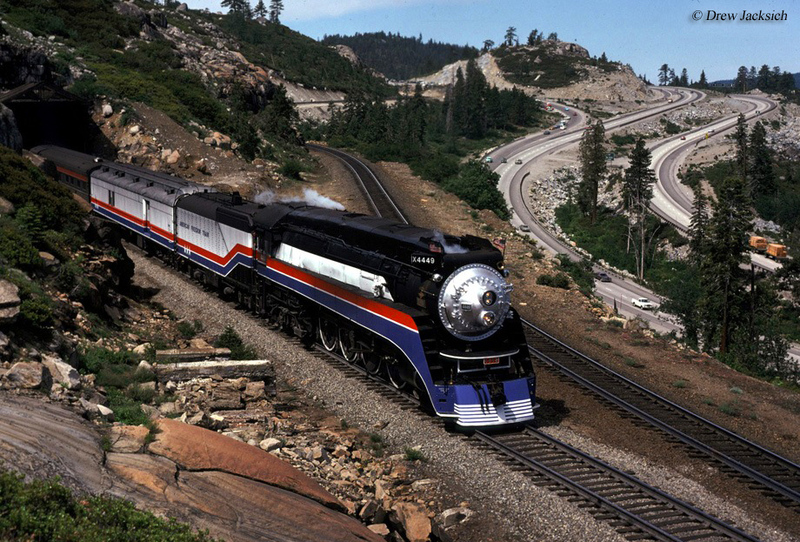 The idea for the American Freedom Train nearly three decades later was first conceived by successful broker Ross Rowland, Jr. who first thought of the idea in 1969 when he saw the popularity of the Golden Spike ceremony in Utah, which celebrated the centennial of the Transcontinental Railroad's completion. However, Rowland realized that for the train to become reality would require a lot of work in a short period of time. He first began soliciting the idea for a second coming of the Freedom Train in 1971 but found little success in the way of sponsorships; no one believed that a steam-powered, cross-country excursion to celebrate the nation's upcoming Bicentennial would be very successful. Additionally, the concept of spending millions of dollars on something that would not earn a dime in returned investment seemed even more frivolous. However, Rowland caught a break during the spring of 1973 when he met Ralph Weisinger who was a close associate of PepsiCo's chairman Don Kendall. Apparently, Kendall liked the concept and quickly approved a sponsorship of $1 million for the American Freedom Train Foundation. Following Pepsi's backing Rowland suddenly found himself with numerous sponsors lining up to fund the train from Kraft Foods to General Motors. Incredibly, help to get the project off the ground even went to the highest levels of government. When President Nixon learned of Rowland's intentions he opened the federal archives to the AFT Foundation, instructing that it be allowed full access to historic documents for display on the train. Such a gesture allowed Rowland to feature such pieces as the Constitution and Bill of Rights. In all, more than 500 artifacts of Americana would be displayed on the train. While Rowland now had the funding he needed, getting the equipment together and in service would be another matter as he had only a few short years in which to do it. During June of 1974 the Preamble Express was launched to scout out the future route of the American Freedom Train, which was officially inaugurated on December 19 of that year by new President Gerald Ford in Alexandria, Virginia. A few days earlier on December 14th the first locomotive chosen to pull the AFT was pulled from its resting place at Portland's (Oregon) Oak Park and moved to Burlington Northern's nearby roundhouse to begin restoration. This steamer was none other than Southern Pacific Class GS-4 #4449, which would be leading the train throughout much of its western excursions. 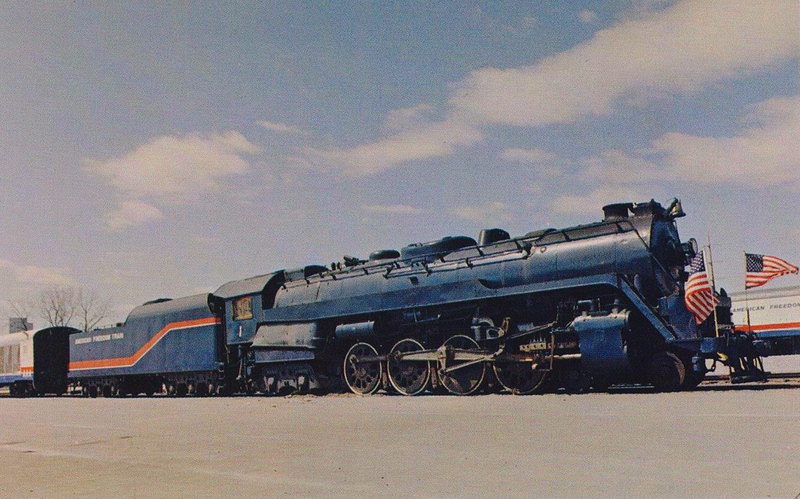 However, at least one other locomotive would also be needed, which just so happened to be Texas & Pacific 2-10-4 #610. 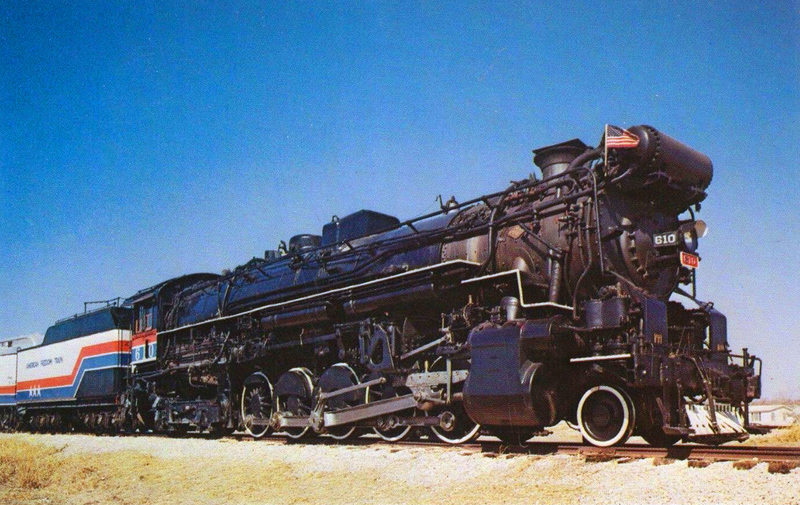 This Texas type steamer was owned by David Pearson, which had an offer from a wealthy associate to restore the locomotive for use on the American Freedom Train during early 1975. Finally, a third locomotive entered the picture during the early spring of that same year. Rowland decided he needed another steamer when he realized that #4449 probably would not be ready in time, which would have forced the AFT to be powered by diesels for a short time. To prevent this from happening Rowland was able to secure former Reading Class T-1 #2101. The big 4-8-4 was owned by Baltimore's Striegel Supply Company, which agreed to sell the Northern for use on the AFT. Incredibly, in just thirty days #2101 was completely overhauled by a group of volunteers working nearly 24/7. On March 28, 1975 #2101 picked up the American Freedom Train at Cameron Station in Alexandria, Virginia and began its journey north to Wilmington, Delaware's Delaware Park where it sat on display from April 1st through 4th. During the next year and a half the train traveled through all of the lower 48 states and witnessed more than 7 million visitors pass through its 10 display cars (most of which were former light and heavyweight baggage cars). Throughout 1976 the AFT toured the country and saw its final visitors on the last day of that year, December 31st. Aside from the historic American documents the train carried rare items such as the Judy Garland's dress from The Wizard Of Oz, moon rocks, President Lincoln's stovepipe hat, and other pieces. The train turned out to be a rousing public relations success, and Rowland went on to become involved with several other steam locomotive projects such as Chesapeake & Ohio #614, the ACE 3000 tests during the 1980s (the concept that steam could be a practical means of main line power once again), and the stillborn Greenbrier Presidential Express of 2011. Since the American Freedom Train concluded two of its locomotives have returned to permanent display, T&P #610 and Reading #2101 (after the unit was caught in a roundhouse fire in 1979). However, #4449 has persevered through the years returning to her "Daylight" livery roots and has continued to handle excursions since her AFT days. 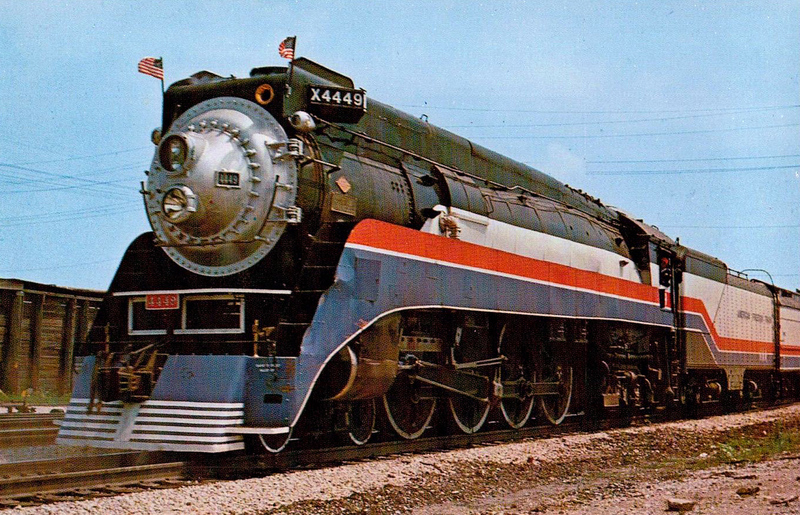 The lasting impression of Rowland's American Freedom Train, however, was its success in demonstrating that steam locomotive restoration and preservation could also be a marketing tool in attracting the public to ride trains. Today, that concept is more successful than ever despite the high initial costs involved to restore such a locomotive back to operational status. For a detailed, historical history of the AFT please click here.